Here is a little hack that will save you money, help you not to spend another dime and make it easy for you to view pictures on your iPhone during eating your cereals. 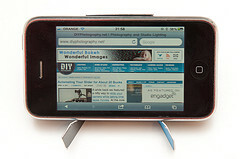 It is the Credit Card iPhone Holder. TADA! A while back I saw this great hack from Flickr user TheCase. It was about abusing a credit card and converting it into a mini tripod thingy. Think Glif, only flatter. The original concept really rocks, and when I went and made one for myself, I discovered that the location of each of the cuts is crucial. So with The Case’s permission, I went out and made a template. Is it made with the best Photoshop practices? Probably not. Will it make you iPhone stand tall? Hell yea! Your credit card. Yea, you show that gear crave who’s the boss!! Template which you can download here. 1. 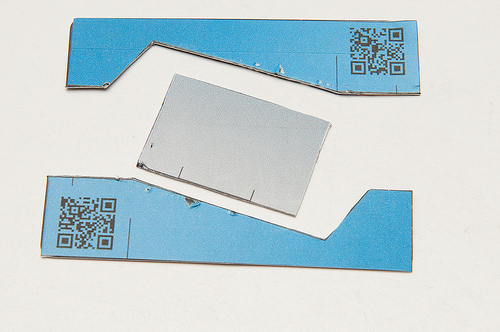 It is best to print the template on a sticker and then apply it to your credit card before cutting. You can always remove the sticker later. 2. Make sure you cut a wider slit on where the black lines are. This will allow the plastics to intersect with one another. 3. You absolutely must do this with a real credit card, not a fake one like I did.